I’m sure we’re all very familiar with this format for “goal setting”, it’s been drilled into us for year! But how many of you could list a different goal format right now off the top of your head? To me, that in itself is an issue. I encourage you to hear me out and listen to this one with an open mind. 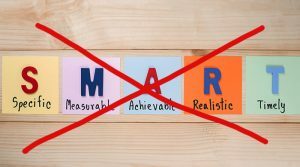 I’m a believer that SMART goals are not only not a good method of goal progression for OT’s but even that they can be detrimental….and I’m about to explain to you my thoughts around this! Loved listening to this podcast, and loved even MORE that I feel validated in feeling the same way! !